Servitization is Leading Manufacturing’s Advance into New Business Models - Infosys Consulting - One hub. Many perspectives. For manufacturing leaders evaluating how to launch a servitization capability, space elevators provide a surprisingly useful object lesson. Servitization, or digitally-driven service management, involves the creation of new digital services – enabled by cutting-edge analytics, embedded sensors, machine-to-machine (M2M) communications and related forms of advanced technology – that are bundled with products. 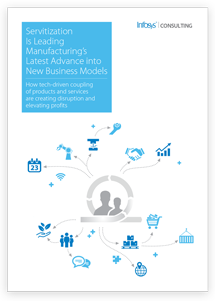 These new manufacturing models, which require a relationship-based sales approach, have helped firms produce entirely new revenue streams, slash costs, lift customer relationships to new levels and carve out sharp advantages over competitors. In some cases, servitization programs have evolved into entirely new companies. Like the carbon nanotube cables that leading scientists are now trying to send tens of thousands of miles into geostationary orbit, servitization programs involve numerous interrelated enabling components that must be understood, evaluated and orchestrated into a smoothly-running operating system. For most original equipment manufacturers (OEMs), the development of servitization capabilities also requires a major mindset shift from selling products to selling outcomes. The concept of servitization – the coupling of service offerings with products – emerged decades ago. Rolls-Royce’s pioneering “power by the hour” approach to support business jet engines in the 1960s marks an early servitization milestone. What is new, however, is how leading manufacturers now leverage digital technology advancements to deploy servitization models that drive significant growth. By 2017, 49 percent of Rolls-Royce’s revenue was generated by the provision of services. Services now account for more than 15 percent revenue and a major portion of gross margins at Apple, which has announced that it will stop reporting unit sales of its manufactured products. Despite its recent challenges, GE projects it will generate $12 billion in digital revenue, largely through servitization models, in 2020. GE Digital was formed from a servitization initiative that swiftly evolved into a massive new business. Daimler’s car2go business has enjoyed a similarly meteoric growth trajectory. Car2go and Daimler’s other mobility services now count 17.8 million customers; that servitization revenue is a key reason why Daimler Financial Services, which houses these mobility offerings, posted record highs in new business, contract volume, and earnings before interest and taxes last year. Aerospace manufacturers using predictive maintenance for key flight components. Construction firms leveraging machine-to-machine technologies within offerings that optimize the timing and execution of construction plans. Energy companies developing managed asset maintenance programs based on massive amounts of usage and environmental data, and much more. Chemicals companies deploying consumption-driven replenishment and supply-planning. It’s complex work, but then so is building a space elevator, which some leading astronautics experts believe will start ferrying equipment into orbit – for as much as 100X less the cost than doing so via rocket-powered crafts – by 2035. The key to planning this type of endeavor is to deconstruct the project into smaller challenges, identify all of the enabling components and key challenges, and recognize that a handful of key considerations are crucial to creating an effective strategy. Scientists have already homed in on three pivotal aspects of getting a space elevator aloft: the material needed to build a cable that will be 100 million times longer than it is wide (carbon nanotubes with crystal graphene as a backup); the counterweight (repurposing orbiting space junk is a strong possibility); and power (solar energy enhanced by laser technology). A viable space elevator program also must extend beyond engineering matters to address less tangible, yet still crucial, drivers of success, such as the political cooperation required to sustain a sweeping, multilateral effort. A similarly practical approach has governed successful servitization planning efforts completed by Rolls-Royce, Alstom, Xerox and Caterpillar among others. While the allure of advanced technologies and revenue increases are seductive, manufacturing leaders should undertake a distinctly pragmatic approach. They should also strive to extinguish commonly held misperceptions about this growing trend while focusing on servitization realities. This report examines different models of servitization, identifying the enabling components and key challenges, and sharing considerations that have proven useful in developing strategies for successful servitization programs. In our experience, identifying the servitization opportunity and setting a strategy can be completed in the same 12-15-week timeframe that other major strategy-setting activities typically require. Download and read our entire report below to learn more and begin planning your journey forward. Shanton is a U.S-based partner focusing on applying advanced operations capabilities to manufacturing and service organizations to integrate and streamline value chain operations. He brings a strong record of success with a deep set of experiences across several industries, including aerospace and defense, automotive, high tech and consumer goods. Shanton joined Infosys Consulting in 2016 after prior leadership roles at Deloitte, Ernst & Young and Capgemini Consulting, where he was the North American lead for their digital manufacturing practice. He is a frequent publisher and conference speaker, and has been featured in industry journals like SupplyChainBrain, Logistics Management and CSCMP’s Supply Chain Quarterly. He is also the lead contributor to the Infosys Consulting co-lead report, State of Logistics Outsourcing study, which is an annual report on the logistics industry. 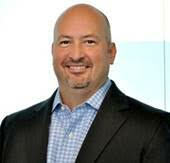 Rafi is a frequent contributor to our firm’s digital platforms and is regularly featured in top industry publications. He is also a sought-after speaker at industry and client events. A perspective on the changing role of the chief information officer in the digital age.